Well. Following the Around the Bay last weekend I ended up having a quiet week. Eventually got around to some productive time Thursday and Friday, spent in XCode and reading Beginning iPhone 3 Development. Nothing to show for it. Gave myself the day off (after riding Around the Bay in a Day yesterday, along with 16,000 others) and wandered into an Apple reseller to play with an iPad. 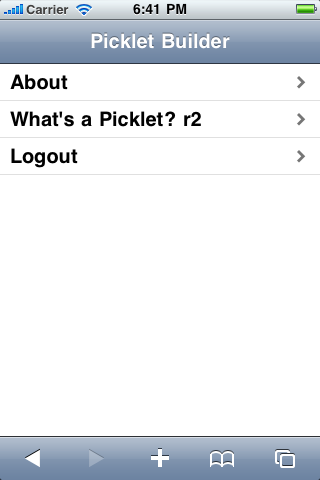 Picklet Builder doesn’t work at all. Interface doesn’t even load. Might be no JSON parser, or something.